The 9mm Luger was invented during the German Empire by DWM in 1904, and now it is one of the most popular and most effective self defense rounds in the world. Due to some major technological advancements, the 9mm has significant stopper power and damage capacity, leading the FBI to release a statement declaring that the 9mm is now the best self defense round on the market. 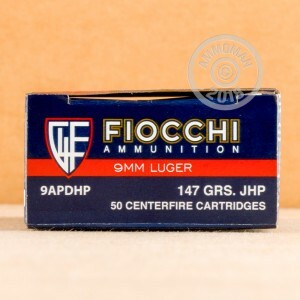 Fiocchi is known for its prowess in the ammunition and firearms market. With these 147 grain, jacketed hollow point rounds, stave off your enemies and keep your family safe. Accurate, reliable, and powerful, these brass cased, boxer primed, reloadable rounds are some of the best self defense rounds you can find. Good News! At AmmoMan.com all orders over $99 will ship for FREE! 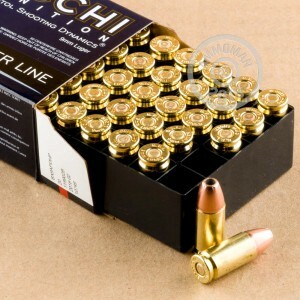 So order this 1000 round case of premium 9mm self defense ammo and the shipping is on us!